Sunday saw an unpredictable 2017 season continue with plenty of shock wins that few saw coming. It also saw some huge performances on both sides of the ball, both from players we have come accustomed to expecting it from, and a few surprise standouts. With that in mind, let’s take a look at this week’s Sunday Standouts on defense. The New Orleans Saints defense has been one of the surprises of the season this year, and safety Von Bell had one of the best games of his career in Sunday’s win. Impressing in coverage with two tackles resulting in a defensive stop, he also added a sack and a hit on four pass rushing attempts, giving him a 43.8 pass rush productivity rating. The big win for the Indianapolis Colts saw several key performances on defense, including one from linebacker Jon Bostic. Two of his four solo tackles on 21 snaps against the run resulted in a defensive stop, giving him a 9.5 run stop percentage that is currently tied for 14th among linebackers this week. The Tennessee Titans defense looks to be a tough proposition for the Baltimore Ravens on paper and, for most of the game on Sunday, that proved to be the case. Interior defender Jurrell Casey was once again dominant, finishing the game with a 16.7 percent run stop percentage, with three tackles resulting in a defensive stop from 18 snaps against the run. 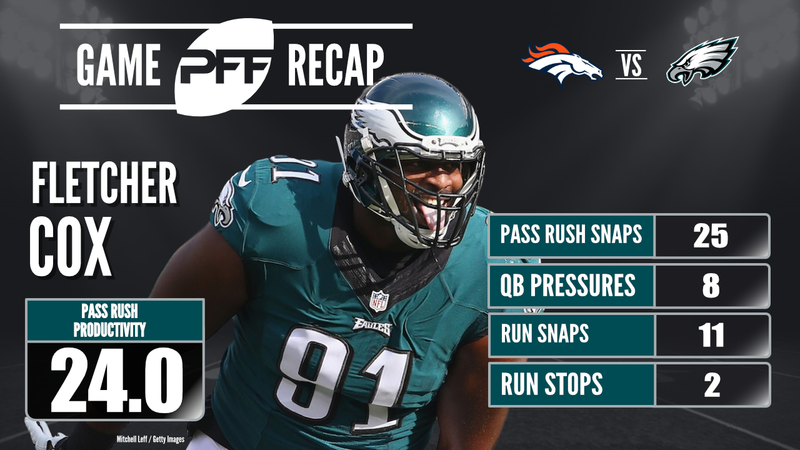 The Philadelphia Eagles had their most dominant win of the season on Sunday, and star interior defender Fletcher Cox played a huge role in that victory. As a pass rusher he was far too much for the Broncos offensive line to handle, registering eight total pressures from 25 pass rushing snaps, and producing a pass rushing productivity rating of 24.0. 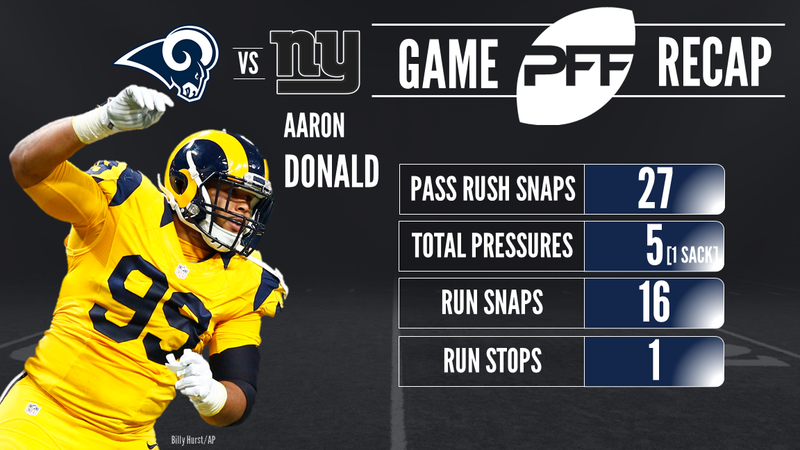 When Aaron Donald plays football on a Sunday, there’s a high probability that you’ll find him among the Sunday Standouts come Monday morning. The Los Angeles Rams star was unblockable once again, and while his run stop percentage of 6.3 percent doesn’t rank among the top 10 from this week, he was still able to beat blockers and force running backs away from the intended point of attack, while he was outstanding as a pass rusher, including coming away with a strip sack. Believe it or not, the Denver Broncos did have defensive players who played well, despite the heavy loss to the Eagles, and edge defender Von Miller was one of them. With five total pressures, including a sack, on 25 pass rushing attempts, Miller’s pass rushing productivity rating of 16.0 was the seventh best mark among edge defenders yesterday. Atlanta Falcons safety Keanu Neal was back to the high level of play we saw from him as a rookie in yesterday’s loss, impressing against the run when lined up in the box. As well as not missing any tackles against the run, he produced a run stop percentage mark of 8.6 percent, with three tackles resulting in a defensive stop from 35 snaps against the run while line up eight yards from the line of scrimmage. The Indianapolis Colts took advantage of the injury to Deshaun Watson and held on to beat the Houston Texans yesterday, and edge defender Jabaal Sheard was one of the best players on the field. Sheard registered two sacks, a hit and six hurries from 43 pass rushing snaps, giving him a pass rushing productivity rating of 16.9. After another huge performance, it’s time to start considering Seattle Seahawks linebacker Bobby Wagner a serious defensive player of the year contender. No linebacker in the NFL is playing at a higher level, and he proved how good he is against the run, in coverage and as a blitzer yesterday. He blitzed just three times in the loss to the Washington Redskins, but came away with a sack, which resulted in a safety, and a hurry, giving him a 58.3 pass rush productivity rating. 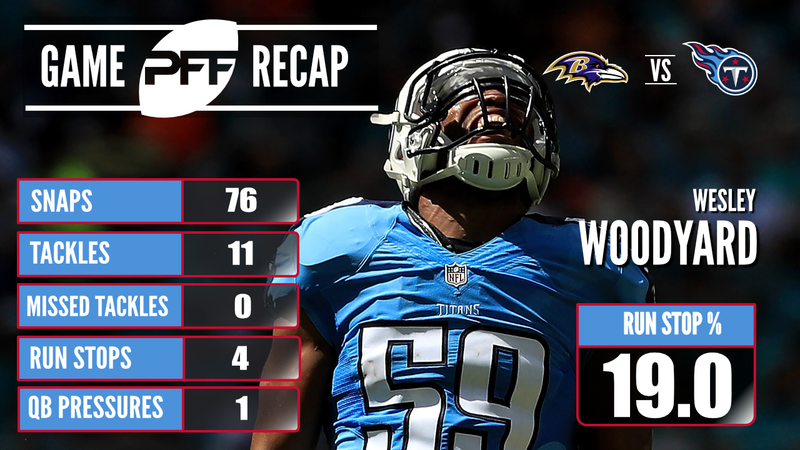 Another Titans defender who stood out on Sunday was linebacker Wesley Woodyard, who was key to shutting down the Ravens rushing attack. Playing 21 snaps against the run, Woodyard produced a 19.0 run stop percentage, with four tackles resulting in a defensive stop.